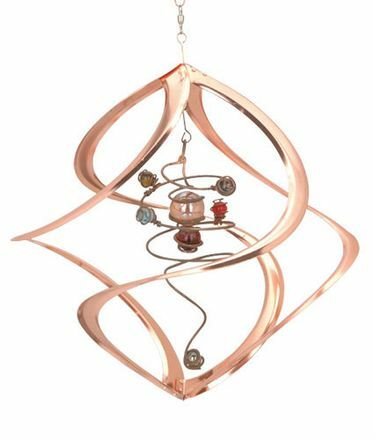 Hang this beautiful 17" Spiral Planet metal wind spinner from any eave or tree and watch the gentle breeze bring planetary motion and delight into your garden or patio. Each of our metal garden wind spinners will twirl in your garden easily on the protected and encased high-quality ball bearing. Long lasting classic elegance and soothing motion delivered, even in high winds! With a delicate hanging spinner design, this garden twirler brings a sense of wonder and illusion as it dances around with a double helix design. Take your spinning garden to a new level of enjoyment with this fabulous 3D wind spinner. Wind Spinners make wonderful garden gifts for anyone that might enjoy a touch of outdoor garden decor. 17" Spiral Planet Copper Wind Spinner. Decorative had-crafted copper plated metal. Includes S-hook swivel for easy hanging and smooth spinning.